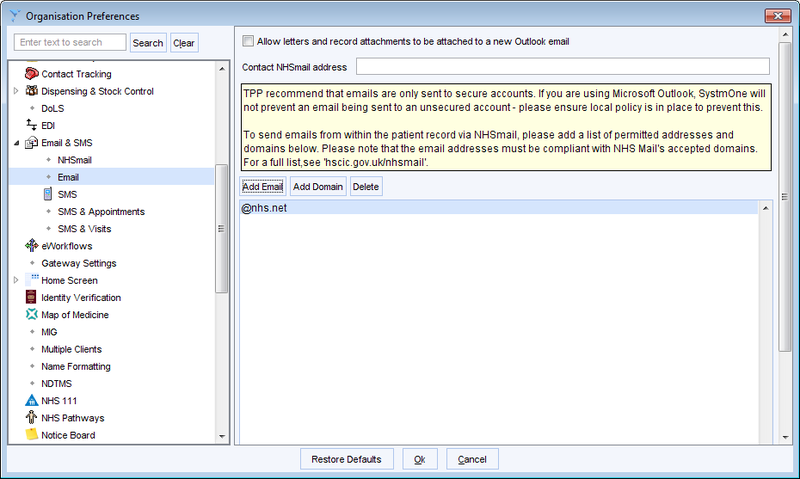 Emails sent from SystmOne are sent from your practice NHSmail account. Setup > Users & Policy > Organisation Preference > Email & SMS > NHSmail. N.B. If you change your password on NHSmail, change it immediately on SystmOne. You can also send email from SystmOne to non @NHS.net accounts. 1. Setup > Users & Policy > Organisation Preference > Email &SMS > Email. 2. Then click ‘Add Email’ or ‘Add Domain’. Remember to only include secure addresses. See NHS Digital for more information.